Two sips unite in one loving cup! 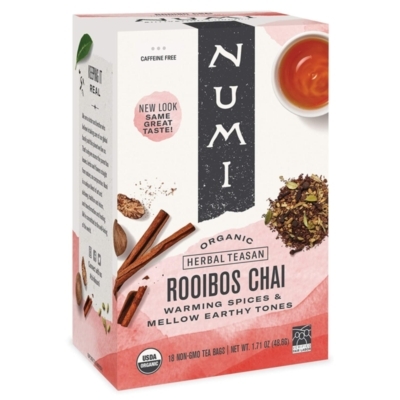 Numi organic caffeine-free Chai blends rich Rooibos and a sultry blend of spices. Piquant cloves, nutmeg, and cinnamon mingle with sweet allspice, vivacious ginger and a kiss of cardamom. Warming spices & earthy vanilla tones. Great with milk! USDA Certified Organic. Fair Trade Certified. GMO free. Gluten free. Natural biodegradable filter-paper tea bags. Box of 18 tea bags.